Arctic sea ice is a complex beast. And the manner in which any melt season progresses is likely to be unique to that particular year. Inherent to this complexity are the vast number of factors that impact the ice. Air temperature, sunlight, clouds, fog, ocean temperature, humidity, wind, precipitation, ocean currents, warm water upwelling and a host of other factors all can enhance or impede melt. 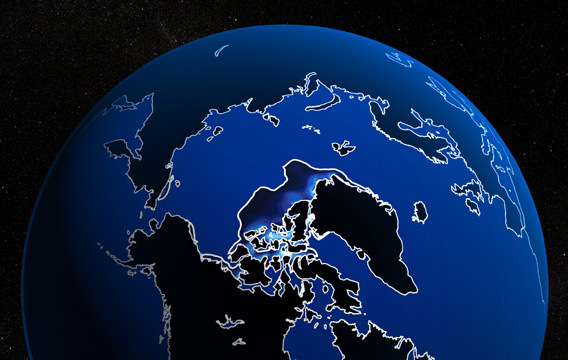 And it is in analyzing and drawing conclusions from these various complex details that a debate rages over the fate of the Arctic sea ice for 2013. Will we see new record lows in area, extent, or volume? Will the Arctic be nearly ice free soon? Or will this year be a pause in the record Arctic melt trend that has been ongoing since 1979? Debates even rage over what specific factors may cause melt or prevent it. Is insolation the primary driver of Arctic ice melt and retreat? How powerful a factor is air temperature? Is warm water upwelling the cause of flash melt events that can happen even when the air temperature is below the -2 C freezing point of saltwater? And it is very worthwhile to debate these issues. Because losing the Arctic sea ice is a big deal. A very big deal. And, inexorably, slower (by around 2030) or faster (between now and 2020) we are losing it. So figuring out how and why this might happen is pretty important. And then we have the deniers… Those who, inevitably, will use data to support their previously conceived world-views regardless of actual facts or trends. 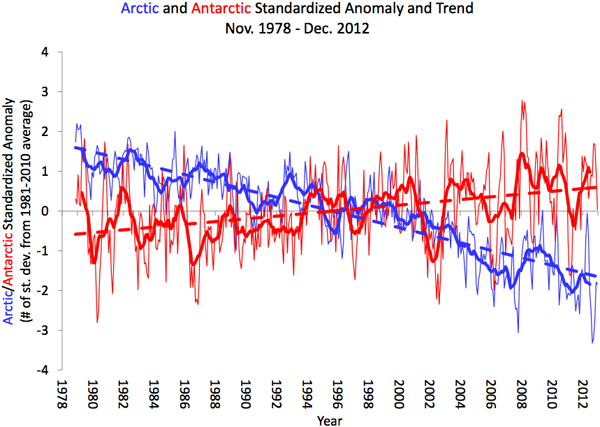 In one example, Steve Goddard, who can be counted on to invariably predict that sea ice will ‘recover’ during any given year, has made a tabloid out of cherry picked data via his blog ‘RealScience.’ Any time either sea ice area or extent approaches the average trend line in any graphs, he can be counted on to post it as ‘proof’ without context that ‘sea ice never melted in the first place, so what are we all worried about?’ Party on like it’s 1950! It’s in out of context and niddling little cherry-picked details that those like Goddard live out their forlorn days of denial. The rest of us, on the other hand, have to deal with facts and context and do our best to honestly work out what’s really happening. Since 2012 was the last year that sea ice hit new record lows in all measures, we’ll use 2012 as a comparison with the current melt season. This comparison is important in that if 2013 melt beats out 2012 melt by end of summer, we have a new record and the raging melt trend continues with a vengeance. If 2013’s melt doesn’t beat out 2012, it’s no indication that sea ice is recovering. 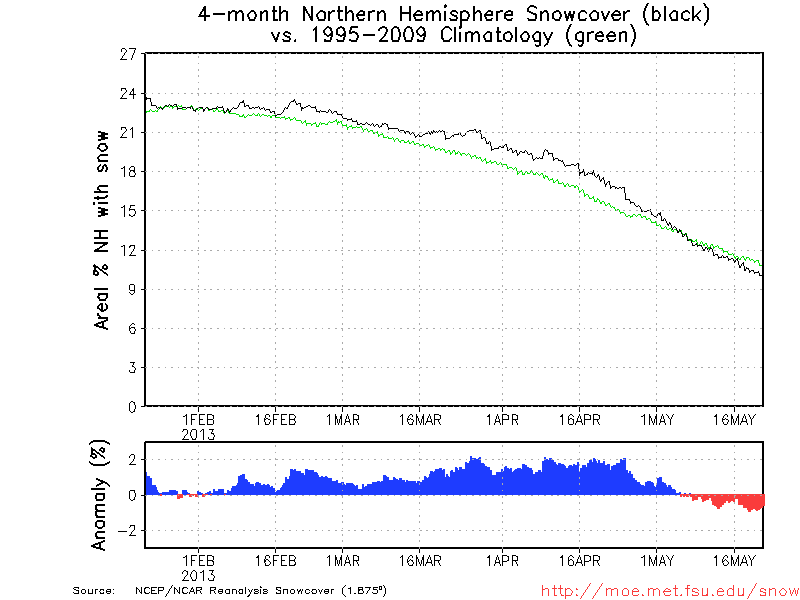 Instead, it shows a pause in the current melt trend. For an actual recovery to be established you’d have to see year after year of expanding and thickening ice. And we’re not anywhere near that. 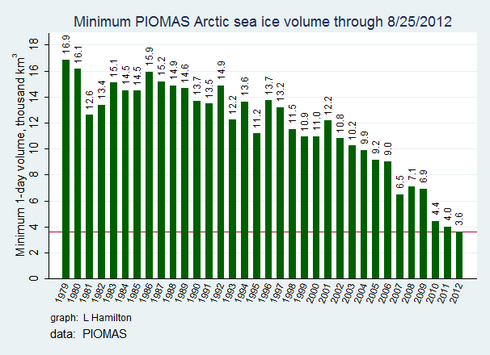 Quite to the contrary, since 1979 we’ve lost 55% of sea ice area and 80% of sea ice volume. Area and volume. These two measures are the most important when figuring out the health of ice. Area measures how much ice covers the Arctic. Volume measures the total mass of ice. But between these two measures, volume is most important. A foot thick film of ice covering 3 million square kilometers of the Arctic is many times less ice than a ten meter thick sheet covering the same region. With this established, let’s look first at area. In 2013, area melt proceeded at about the same pace as 2012, slowly progressing through both April and into early May with measurements in the region of past years. However, in 2013, as the second half of May passed, sea ice became more spread out. A number of storms had churned through the Arctic, pushing ice out toward the fringes. This higher coverage delayed melt at the ice edge even as the thicker, central ice thinned. As a result, May 30 sea ice area is at 10.6 million square kilometers, or about the same as May 30th of 1991. Now, if I were Steve Goddard, I would proclaim that the sea ice has recovered, global warming is bogus, and that the work of 97% of the world’s climate scientists is moot. But since I am not Steve Goddard, I’ll actually provide you with a little more in the way of in-depth analysis. Since, as we noted above, sea ice area is only part of the story, and a less important part at that, let’s take a look at the most important measure — sea ice volume. Now, the last official volume number we have is from PIOMAS for end of April 2013. And that number shows sea ice volume at its lowest levels ever for that day by about 100 cubic kilometers. Not a huge divergence from the previous record low, but a record low nonetheless. Since we’ll have to wait for the May numbers to come out at around June 15th, we’ll have to rely on proxy data to give us an idea where sea ice volume currently stands. But the start point, at the beginning of the month, was a new record low. Moving forward, we will use the CICE images above as a comparison. Looking at these images, it is first important to consider what we know about 2012. 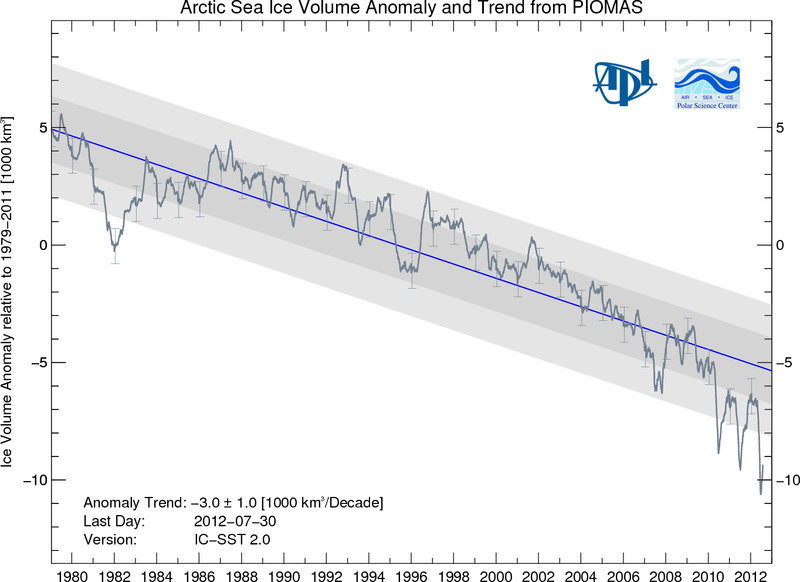 First, we know that sea ice volume at this time for 2012 was edging back into record low territory as June approached. So the CICE map on the bottom is a picture of a record low or near record low for that date. And for this comparison, we have a visual base-line. Looking at the 2012 CICE map we immediately notice a few things. 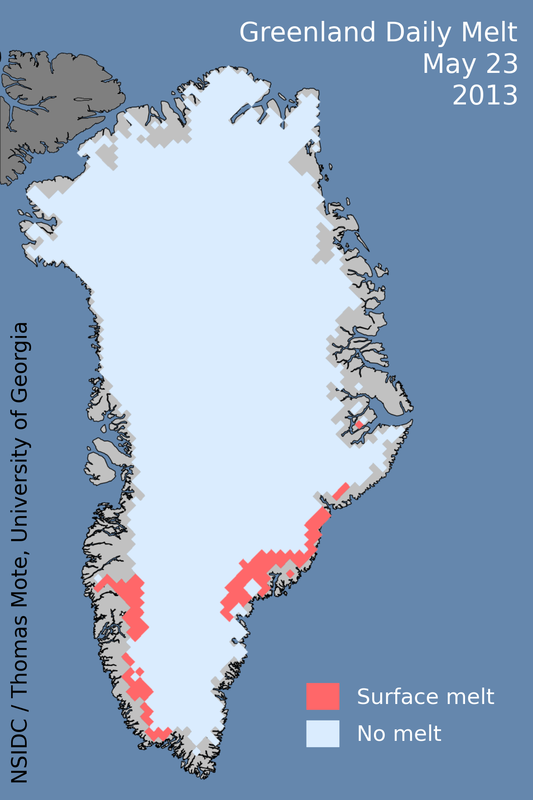 First, a degree of thick ice remained just north of the Canadian Arctic Archipelago. Second, we have a number of areas of edge melt occurring in the Kara and Laptev seas, in the Bering, near the Mackenzie Delta, in Baffin Bay, and some slight melt occurring in Hudson Bay. Now let’s compare this map with the 2013 map. 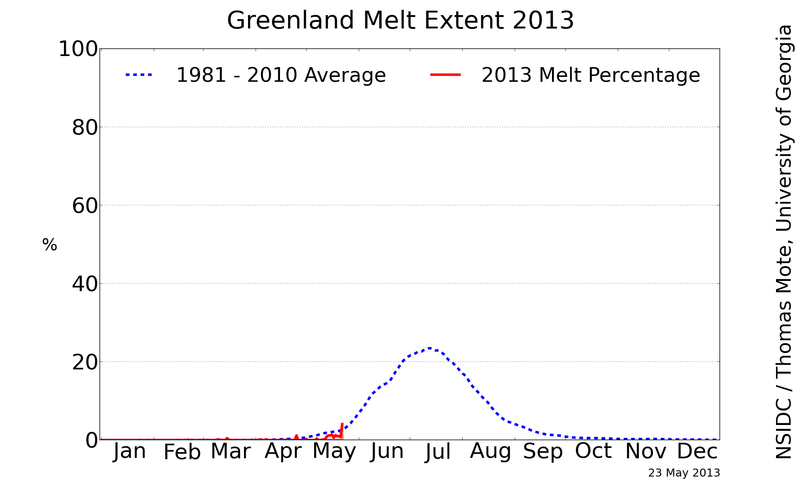 Immediately, we notice that edge melt for 2012 is greater than 2013 at this time. The Kara and Laptev seas, especially show more open water in 2012 than in 2013. Baffin Bay and the Beaufort also show more edge melt. 2013 shows a slightly faster rate of melt for the Bering Sea and Hudson Bay, however. So by looking at these two maps we can confirm what we already know by looking at the sea ice area measurements — the sea ice is more widespread in 2013 than it was in 2012. It is important to note that Cryosphere Today’s sea ice area measurement doesn’t take into account all the little cracks and holes in the central ice. Their analysis is not so finely detailed. 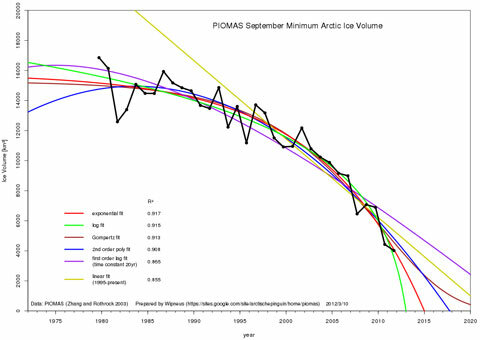 Otherwise, area measures would likely be lower for 2013, because the central ice is cracked and riddled as never before. This cracking and riddling also has an impact on overall sea ice volume. When looking at volume in the central ice pack regions, we find that total amounts of sea ice in 2013 may well be near 2012 amounts. For the 2013 central ice region shows a remarkable lack of ice. 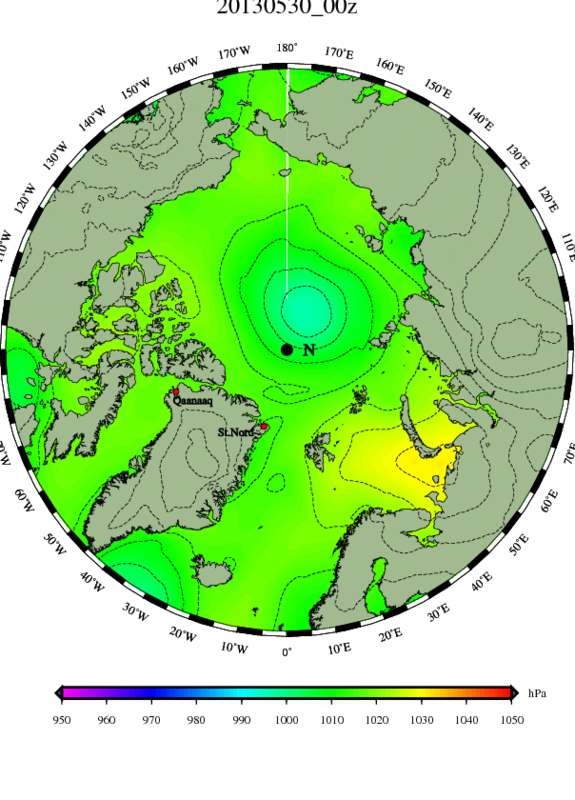 Central sea ice thickness on the CICE map for 2013 is far less than that shown for 2012. Furthermore, 2013 CICE maps show an ongoing erosion and jostling of central sea ice where 2012 saw very few such impacts during May. 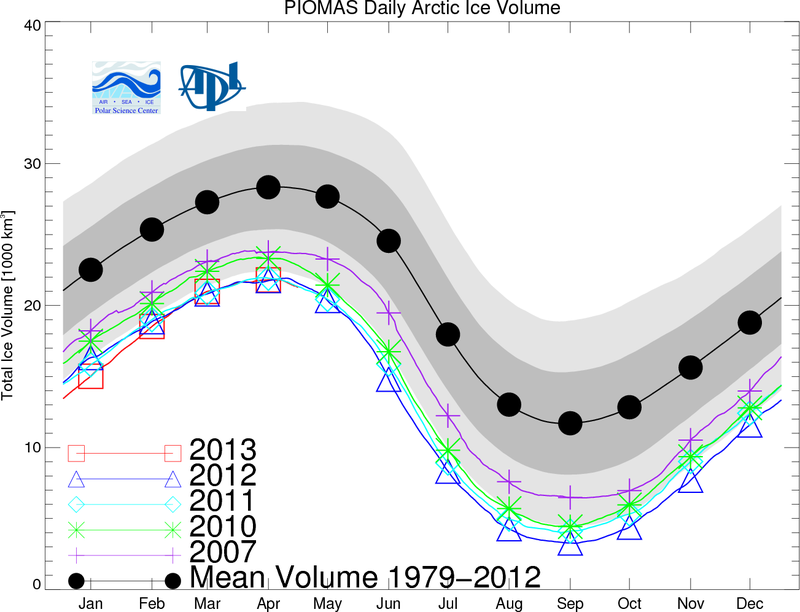 In the end, what we see is 2012 with more ice edge melt while 2013 shows more central ice volume loss. And where does that put us in total volume measurements? 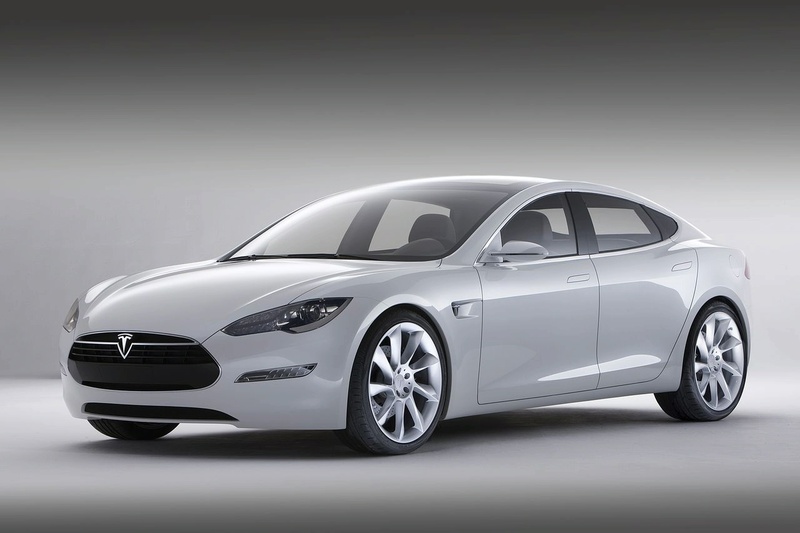 For more certainty, we will have to wait for the June, 2013 PIOMAS update. However, it is more than reasonable to assume, based on the CICE maps, that current Arctic sea ice volume is near to record low levels. In the end, 2013 ice is overall thinner and more spread out than 2012 ice. And this state makes it vulnerable to rapid melt, opening of holes in the central ice, separation of large sections of the sea ice, and disruption by storms and strong wind events. Overall, the ice pack is less unified than even 2012. So concern levels remain high for new record losses come end of summer. Much higher, in fact, than sea ice area and extent measures would typically lead one to believe. And as for shouts of ‘recovery,’ they are hollow as the central Arctic’s sea ice. A major drought that began last year, ramped up through last summer and autumn, and lingered through winter and spring of 2013 continues to have major impacts. Western states remain severely impacted with fire risks flaring throughout California, Nevada, Arizona, New Mexico, Colorado, Texas and Oklahoma. Meanwhile, Texas, Oklahoma and New Mexico continue to battle over water rights as drought conditions persist. 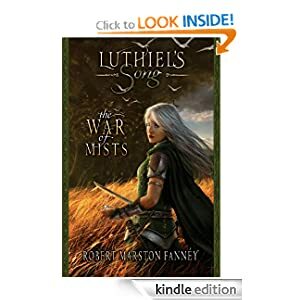 That said, the drought appeared to be slowly, tortuously abating as rains and record floods swept into various areas and began to provide relief. Now, about 46 percent of the US is currently suffering from some stage of drought. Though still very widespread, area impacted by drought last year surged to over 60 percent. Now, as it appeared abatement and a slow return to normal conditions would continue, new forecasts show drought re-expanding into the plains states in time to threaten summer corn crops. For a farming region hoping to recover from the worst drought since 1955, and for a global food system teetering at the edge of insecurity this is a terrible forecast. Further, such a return to drought conditions would have serious monetary impacts. According to reports from AG Professional, a continuance and expansion of this drought could result in as much as $200 billion dollars in damages making the current drought the most costly weather disaster for 2012-2013, beating out even the far-reaching impacts of Hurricane Sandy. It is also worth noting that the period during which these extreme events occurred was the 8th warmest on record globally. Over the past month or so, there’s been quite a bit of controversy over a scientific measurement called equilibrium climate sensitivity (ECS). Among the media, confusion abounds. In a recent instance, The Economist, taking a number of scientific studies out of context, made the dubious claim that a slower pace of temperature increase during the first decade of the 20th century indicated a lower level of climate sensitivity. Other news outlets continue to remark on new climate sensitivity studies without appearing to understand what equilibrium climate sensitivity really means or, more importantly, understanding the inherent limitations of model-based ECS estimates. And, lastly, does a slower pace of warming over the first decade of the 21rst century mean climate sensitivity is less than previously expected? In its broadest sense, ECS defines the long-term increase in surface air temperatures that results from a doubling of atmospheric carbon dioxide. The measure is important because it gives a broad indication of how much climate change and related harm to humans and environments results from a given amount of carbon dioxide being pumped into Earth’s atmosphere. Under these basic principles, ECS provides a good guideline. However, ECS operates under a major handicap. The measurement does not include the effects of slow climate feedbacks like loss of ice sheets or albedo change to Earth’s surface. How Accurate is Equilibrium Climate Sensitivity? Because ECS leaves out slow feedbacks, it isn’t a very accurate measure of potential long-term warming. That said, in the early days of global warming modeling, ECS was seen as the most useful measure because models had difficulty handling complex physical forces that resulted from slow feedbacks. The result was that climate science came to rely on a less accurate measure because it was more expedient to use in modeling. For these reasons, ECS was developed as a simpler way to model atmospheric temperature increase caused by carbon emissions over the long term. And because it was difficult to model slow feedbacks, they were not included in the measurement. So, though ECS is a useful measurement for the purposes of more easily modeling atmospheric temperature increases, ECS dramatically undershoots long-term global temperature increases. The reason for this is that slow feedbacks such as albedo change and ice sheet melt have powerful impacts. We know this because ECS models tend to present about half the total sensitivity observed in the paleoclimate data for a doubling of CO2. This second and more accurate, but far more difficult to model, measure of climate sensitivity based on all global feedbacks acting in concert is called Earth System Sensitivity (ESS). In total, the combined Earth System Sensitivity is far greater than the more model friendly Equilibrium Climate Sensitivity. By how much? Based on paleoclimate data, total long term ESS is probably about double that of current ECS estimates. Unfortunately, these different definitions can be very confusing to the layman observer. As an example, the IPCC estimates ECS to be between 1.5 to 4.5 degrees Celsius for each doubling of CO2. From an average of these measures, the IPCC gets its estimate ECS of about 3 degrees Celsius. On the other hand, observations of past Earth climates show temperatures averaging at least 6 degrees Celsius warmer when CO2 levels were around 560 parts per million, or about double what the IPCC estimates for ECS. Yet ECS is, most often, the official, published estimate for how much the Earth will warm. Yet, as shown above, given our current understanding of past climates, the ECS model estimates are short by half. When looking at the stunning impact of CO2 on global temperatures in the paleoclimate data, one wonders why ECS is used, so often, without this broader qualification? Why, instead, don’t estimates of ECS provide a broader indication that end temperature increases are likely be double those seen in the climate models? For the most part, scientists are trying to determine if slower atmospheric warming since 2000 indicates that climate sensitivity, in this case an already, short by half, equilibrium climate sensitivity, is less than previously expected. For context, average atmospheric temperatures increased by about .2 degrees Celsius during the 1990s while atmospheric temperatures during the 2000s increased by about .1 degree Celsius. This apparent slowdown in atmospheric warming has caused some to question whether equilibrium climate sensitivity is less than previously expected. One paper, published by Alexander Otto in Nature indicated a long-term equilibrium climate sensitivity of about 2 degrees Celsius based on new data from recent decades. This new model estimate is still in the range of 1.5-4.5 degrees Celsius provided by most model runs. Furthermore, the study found almost no significant changes to equilibrium climate sensitivity in the long-term trend. Another Nature study, conducted by Roger Bodman of Victoria University, also found that model estimates for equilibrium climate sensitivity were not lower than previous estimates. The conclusions to draw from this information are manifold. The first is that model estimates for equilibrium climate sensitivity are not the best measure of total, long-term climate change. For that we should take a look at past Earth climates. From these measurements, we can find an Earth System Sensitivity of about 6 degrees Celsius for each doubling of CO2. This measure is consistent with Earth climates 50-65 million years ago when CO2 measured about 580 parts per million and temperatures were more than 6 degrees Celsius warmer. The second conclusion is that long-term change will likely take many centuries to completely unfold. So long-term climate sensitivity measures like ECS or ESS are not good indicators for how fast Earth temperatures will increase within a given decade. Some decades may see relatively slow increases, some little or no increase, and some remarkably rapid increases. However, the overall trend will be for warming, and probably a more rapid pace of warming than that seen in the geological record due to the fact that the human CO2 forcing is currently so powerful. Furthermore, the .2 degrees Celsius warming during the 1990s and the .1 degrees Celsius atmospheric warming during the 2000s are not entirely indicative of what the long-term trend will look like. In all likelihood, natural variability favored warming more during the 1990s and less so during the 2000s. This is hinted at in the El Nino/La Nina cycle with many powerful El Ninos (which tend to warm the atmosphere) evident during the 1990s while La Ninas (which tend to cool the atmosphere) were more prevalent during the late 2000s. The third conclusion is that major Earth system feedbacks are beginning to kick in that are likely to make observations of the climates of past decades less relevant. Loss of albedo, ice sheet melt, ocean heat uptake, and environmental carbon release all have a roll to play in future atmospheric warming. Together with a continued and growing human CO2 forcing, these and other factors will determine the pace of warming over the next century. Under business as usual, worldwide CO2 levels hit somewhere between 800 and 1000 parts per million by the end of this century. Such a strong forcing is likely to have very powerful and damaging effects on Earth’s climate system. Even the models that do not take into account slow feedbacks are showing warming of 5-7 degrees Celsius by the end of this century if business as usual emissions continue. And for such a high degree of warming to take place even without the additional contribution from a number of slow feedbacks would be a terrible result. Fourth, it should be noted that ‘slow feedbacks’ are already beginning to emerge at a more rapid pace than previously estimated. 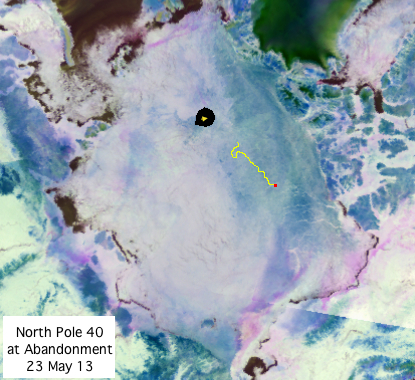 One example, loss of sea ice, is already reducing the northern polar region’s albedo. Another instance, methane hydrate and tundra methane release, are also already adding a positive amplifying feedback to human-caused warming. Finally, it is worth noting that a more rapid than expected melt of polar ice would temporarily keep temperatures lower at the cost of a more rapid pace of sea level rise combined with much more extreme weather. Such higher than expected paces of melt are entirely possible and, in certain regions, appear to be happening now. In one example northern polar sea ice has experienced an 80% loss of volume since 1980. The result is that northern hemisphere sea ice melt is occurring 80 years ahead of model projections. According to reports from NOAA, an ‘extremely active’ hurricane season lies on the horizon just one year after an unprecedented and freakish hybrid hurricane Sandy devastated the US East Coast. Overall, forecasters expect between 13 and 20 named storms with 3-6 major hurricanes potentially in the offing. The average season hosts 12 named storms. So these numbers may well be harbingers for a dangerous year. This is a dire forecast, especially coming one year after Sandy. Usually, natural variation will bring a pause in activity after years involving powerful storms. 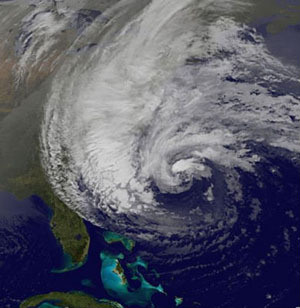 However, the Northeast US has suffered two major storms in two years. Now, forecasters are calling for yet another year where powerful storms threaten US shores. Conditions for powerful storms come from a number of factors. The first is that Atlantic Ocean water temperatures remain well above average in most regions. African dust, which tends to suppress storm development, is less and less prevalent. ENSO conditions in the Pacific remain neutral — La Nina tends to enhance Atlantic storm development while El Nino tends to suppress it. All these conditions point toward a more active year. One factor not taken into account for current official forecasts is the present state of the polar jet stream. That said, meteorologists and climatologists have been presented with quite a lot to chew on as a new hurricane season emerges under a regime of rapid Arctic changes. Erosion of sea ice has resulted in greater dips in the jet. The result is that polar frontal systems are more likely to encounter tropical systems steaming northward. As such, the formation of storms similar to Sandy becomes more likely. With sea ice values low and going lower, it appears that the next few years will serve as a test to determine if this entirely new atmospheric state will result in a greater number of these powerful hybrid storms. The atmospheric basis for the formation of such storms, however, is already in evidence with powerful alterations to the polar jet resulting in a severe winter in Europe and abnormal warmth for the US west coast and western Canada. Let’s hope these dips don’t line up in such a way as to make polar and tropical storms meet again as they did last fall. Human caused warming is a global impact. It heats the atmosphere, it melts ice, and it warms the oceans. Yet, often, we find ourselves squabbling with an increasingly inane, irate and out of touch set of climate change deniers over one third of this equation: atmosphere. And even though evidence of inexorably increasing atmospheric temperatures, worldwide, is enough to bury any climate change contrarian under a mountain of facts almost as large as the 800 cubic kilometers of ice that melted from Greenland last year, it is still worthwhile to look at all these systems and see how they are responding to human warming. This week, CO2 levels averaged just a hair shy of 400 parts per million, a level not seen since the Pliocene, 2-4.5 million years ago. During this time the atmosphere was much warmer, there was much less ice, and ocean levels were much higher. Long-term, if atmospheric CO2 levels remain at 400 parts per million or higher, the least we can expect is about 3-4 degrees Celsius of warming, almost all Arctic ice gone, and sea levels about 75 feet higher than they are today. CO2 is the most powerful long-term governor of atmospheric temperature. It has been compared to the control nob on the Earth’s global thermostat by atmospheric scientists. In the past, as CO2 rises, so does global temperature. If CO2 falls, so does temperature. If there’s no CO2 in the atmosphere, all water vapor falls out and freezes, leaving Earth as a snowball. If most of the atmosphere was composed of CO2, Earth would look a lot more like Venus. So, in short, it’s established that rising CO2 means increased warming. 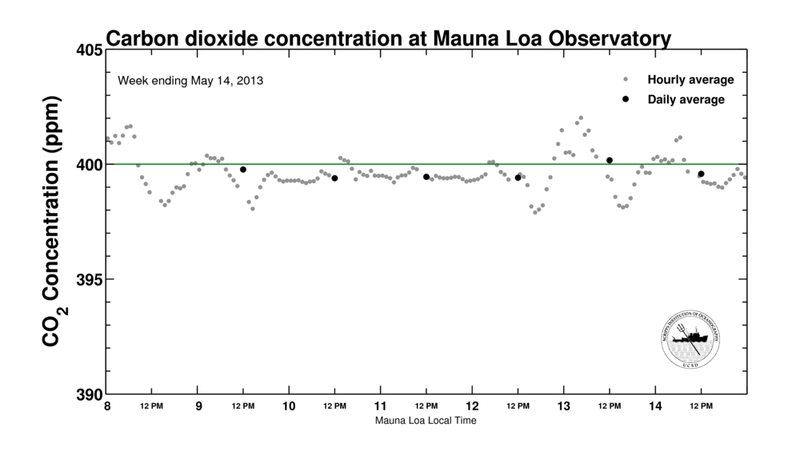 What’s most important to our current exploration is that CO2 levels are rising. And what that means is one thing — the Earth will warm. How will this happen? The atmosphere will heat up, the oceans will warm, and ice will melt. In the above graph, we can get an idea of how much and how rapidly CO2 has risen over the past 300 years. In the 1700s, human carbon emissions were much less than today. England was one of the only countries involved in wide-scale use of the fossil fuel — coal. So CO2 levels remained about at a level equal to past inter-glacial of around 275 parts per million — a level that had been steady for over 10,000 years. 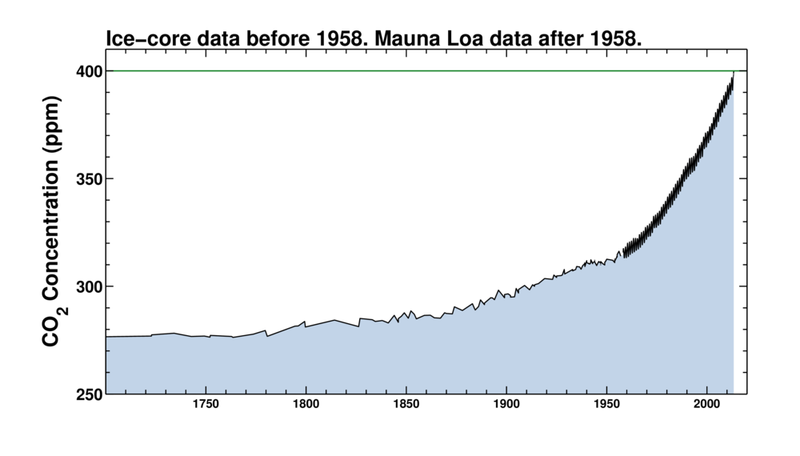 Then, in the 1800s we began to see a gradual rise in world CO2 levels. Over the course of one century, CO2 increased from 275 to 290 parts per million as industrialization began to ramp up and use of fossil fuels became more wide-spread. This increase of about 15 parts per million CO2 over the course of a century was already about as fast as anything that had ever occurred in the geological past. If sustained over centuries, such a rate would be enough to push a powerful warming. But what happened next was catastrophic. In the 20th century, worldwide CO2 went from about 290 parts per million in 1900 to around 375 parts per million in the year 2000. This rise of 85 parts per million over the course of a century was much faster than any rise in CO2 previously detected by scientists. What it represented was a powerful forcing pushing the world’s atmosphere, oceans, and ice sheets to ever greater levels of warming. By the turn of the century, this increase in CO2 had already set off at .6 degree Celsius increase in global land and ocean temperatures, pushed the recession of a majority of glaciers around the world, caused sea ice area, volume and extent to begin to fall off, and set Greenland and Antarctica to melting. This initial punch was just the opener for a long age of Earth changes that were a result of human-caused climate change. In the first 12 years of the new century, world CO2 levels continued to rise at ever-increasing rates. About another 25 parts per million CO2 was added to the global total and we are now poised to break the 400 part per million threshold. At this stage, land and ocean surface temperatures have risen by about .8 degrees Celsius, 9 out of ten glaciers in the world are receding, the rates of ice melt from Greenland and Antarctica are accelerating, and Arctic sea ice volume has declined by more than 80%. The power of CO2 to govern Earth’s temperature and, by extension, climate, rests in its heat-trapping characteristics. So as CO2 concentrations in the atmosphere have dramatically risen, the heat trapping characteristics of the Earth’s atmosphere have also increased. The result is that more of the sun’s radiation is being absorbed by the Earth than is being reflected back into space. This characteristic is called an energy imbalance. Over time, this imbalance will be resolved by Earth warming, which will result in more radiation being sent out into space and equilibrium will again be achieved once a higher temperature is reached. 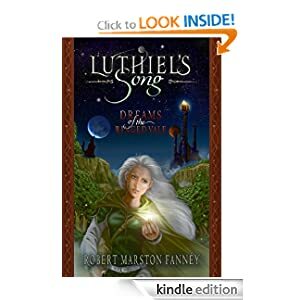 Currently, the energy imbalance of the Earth is about .6 Watts per meter squared or enough to warm the Earth by about another .5 to .7 degrees Celsius before reaching equilibrium. So, in total, given the current energy state of the Earth’s atmosphere, we have at least another .5 to .7 degrees Celsius locked in over the next couple of decades even without further greenhouse gas emissions or the contribution of a number of amplifying feedbacks. The re-balancing of Earth’s energy will result in heating the atmosphere, warming the oceans and melting ice in the form of glaciers, ice sheets, and sea ice. In short, rising levels of CO2 in the atmosphere continued to force global temperatures higher until they finally reached a .8 degree Celsius increase over the 1880s. This surface temperature increase is a powerful visible sign of global warming caused by human activity. To wit, an increasing number of climate change deniers and contrarians are trying to argue that human caused global warming has stopped. To support this conclusion, they point to a ‘plateau’ in atmospheric temperature increases occurring over the last five years. To do this, they must ignore the fact that 2010 was the hottest year on record even as they continue to cherry pick data to support some rather obviously skewed conclusions. Others have claimed, using a curve fitting analysis that is unsupported by scientific evidence, that global temperatures will continue to plateau until 2040 when Earth will undergo another step increase to higher atmospheric temperatures. With forcing so high and greenhouse gasses increasing at such a rapid rate, such a conclusion is difficult to support without major ocean heat uptake or extraordinarily rapid melt of glaciers, sea ice, and ice sheets. Even if such an event, however unlikely, were to happen, it would not signal that the Earth is cooling. A pause in atmospheric warming while the oceans continued to heat up and ice continued to melt does not a cooling world make. In order for the ‘cooling’ contrarians claim to be established, you would have to see a combination of atmospheric cooling, ice increase, and ocean cooling. In truth, what is happening and what continues to happen is exactly the opposite. The larger fact is that the atmosphere is warming, remains at record high temperatures, and that Earth’s energy system remains out of balance even as CO2 levels increase. The result is that atmospheric temperatures will continue to increase as time moves forward. 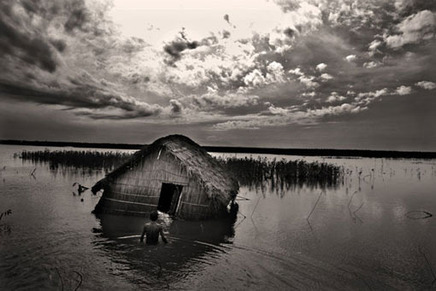 Most likely, the next El Nino year will break the record set just three years ago in 2010. That said, it is worth noting that the lion’s share of CO2 forcing goes to work warming the world’s oceans and melting the world’s ice. As a result, atmospheric temperature measurements only take account of the tip of the human global warming ice burg. The reason for this is that interplay between the Earth’s atmosphere and the ocean surface, heat transport of atmospheric heat through the surface and into the middle and deep ocean, and evaporation of water all serve as heat uptake processes that are not accounted for in the atmospheric temperature readings. So if you want to get a better idea of how rapidly the Earth is warming, you also need to take into account ocean heat content. Until recently, there were very few comprehensive studies of ocean heat content. So most warming studies took into account only atmospheric heating alone. However, recent studies by Magdelena Balmaseda, Kevin Trenberth and others have opened a new field of middle and deep ocean heat measuring providing yet another overwhelming volume of evidence pointing toward a rapidly warming world. 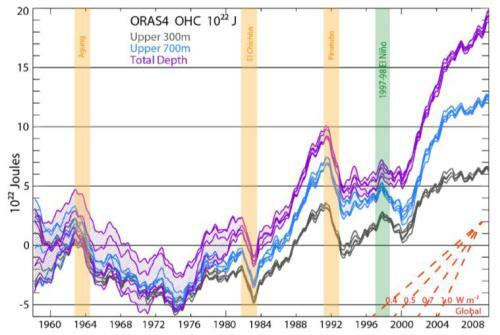 The above graph shows a very rapid ocean heat content uptake occurring in the period of 2000 onward. As a result, a greater portion of the world’s warming ended up in the oceans even as atmospheric temperatures continued to move higher. It shows an increasing pace of transfer of heat from the atmosphere to the ocean — a result of a steadily strengthening CO2 forcing. When combined with atmospheric warming, these measurements show a powerful warming effect both on the atmosphere and on the ocean. The result is that it appears both are warming in steps. One interesting point to make is that during the 1990s, the Earth’s atmosphere appeared to warm rapidly while ocean warming slowed. During the 2000s, the pace of atmospheric warming tended to be slower while ocean warming speeded up. It is likely that the pace of ocean heat uptake has a direct impact on the atmosphere and that these systems are involved in a complex dance as Earth warms. For a long time, ocean turnover has been seen as a system that could slow global atmospheric temperature increases. Yet this inertia comes at the cost of more ocean evaporation. The result is that more water vapor ends up in the atmosphere. And since water vapor is a powerful greenhouse gas, the longer term effect would be greater warming. More ominously, warming oceans house a large volume of methane hydrate. In a world of warming oceans, a portion of this gas, now locked in icy formations on the ocean floor, is likely to be liberated. Since methane is a powerful greenhouse gas, its liberation will likely combine with increasing water vapor to push atmospheric warming higher. Ocean turnover, heat absorption and warming, therefore, should best be seen as an inertia that, over the course of decades, has the potential to slow down human warming. That said, at least two major amplifying feebacks — water vapor and methane hydrates — also emerge to greater and greater degrees as the ocean warms. So, in summary, what we have witnessed, thus far is both substantial atmospheric and ocean warming as a result of human CO2 increase. Now let’s look at the third system — the world’s ice. The final measure of human caused global warming impact includes phase changes between water and liquid and liquid and gas. This is an important measure because it takes energy just to change matter from one state to the next. For example, the energy required to melt ice at zero degrees Celsius is 334 kilojoules per kilogram. This extra energy required to melt ice without increasing temperature, represents an invisible barrier to temperature increase. A similar barrier lies between water as a liquid and water as a gas. So any melting of ice takes up energy that would instead be used to heat the atmosphere or warm the oceans. As such a change in phase from solid ice to liquid water is one more sign that the Earth is warming. For global ice melt, we have a number of rather comprehensive measurements: glacial melt rate, Greenland melt rate, Antarctic melt rate, and sea ice volume loss. Though no complete measure, as yet, has been assimilated to determine the total volume of ice lost each year, a combination of these measures can give us a good indication. First, lets start with rates of glacial ice loss. Though no total volume measurement is given for all the world’s glaciers it has now been observed that 9 out of 10 glaciers are losing ice more rapidly than they are gaining ice. In almost all regions around the world, major mountain glaciers are rapidly receding, a sign that global warming is steadily advancing. 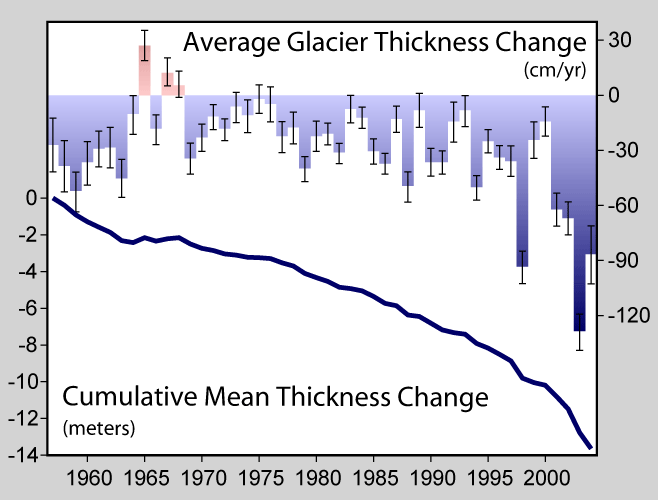 Average glacier mass balance provides a good catalog of this change. What the above image shows is that the world’s glaciers have lost, on average, about 14 meters of thickness since 1955 and are now losing mass at the rate of around 80 centimeters of thickness each year. Not only does this table show mass loss for glaciers continuing over time, it shows that the rate of mass loss is increasing. These statistics only involve the world’s continental mountain glaciers. If we want to get an ever-clearer picture of the ice, we need to take a look at Greenland and Antarctic ice mass loss. 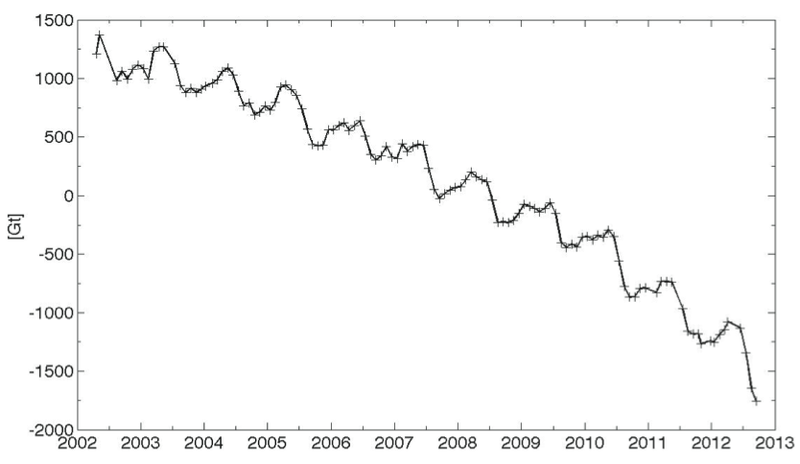 For Greenland, satellite measurements have shown an increasing decline in total ice mass over the past decade. What the above image shows is an ongoing loss of ice since 2002 with the rate of loss increasing steadily through the start of 2013. Average rates of loss in recent years have been on the order of 500 cubic kilometers per annum, with a massive loss of about 800 cubic kilometers occurring between 2012 and 2013. Antarctica has shown a similar rate of decline which, though slower than Greenland is still contributing high and increasing rates of ice melt. What has been shown is that this rate of melt for land-bound ice at both poles is rapidly increasing. According to a statement from NASA in November of 2012, the current rate of polar melt from Greenland and Antarctica is now three times the rate of melt during the 1990s (NASA statement here). Moving on to sea ice, we find similar rates of loss in the northern hemisphere. In the southern hemisphere, we have a set of counter-trend circumstances that have resulted in modest sea ice gains. Northern hemisphere sea ice is perhaps the most dramatic example of human caused warming in the form of ice melt. Sea ice volume has fallen by over 80% since 1980 with the pace of melt accelerating since 2000. The following graph provided by PIOMAS vividly shows this devastating decline. What these two graphs show is a loss of, on average, 750 cubic kilometers of sea ice in the northern hemisphere at the end of each summer. This high rate of loss adds to Antarctic land ice mass loss of around 300 cubic kilometers each year and Greenland mass loss of around 500 cubic kilometers each year. 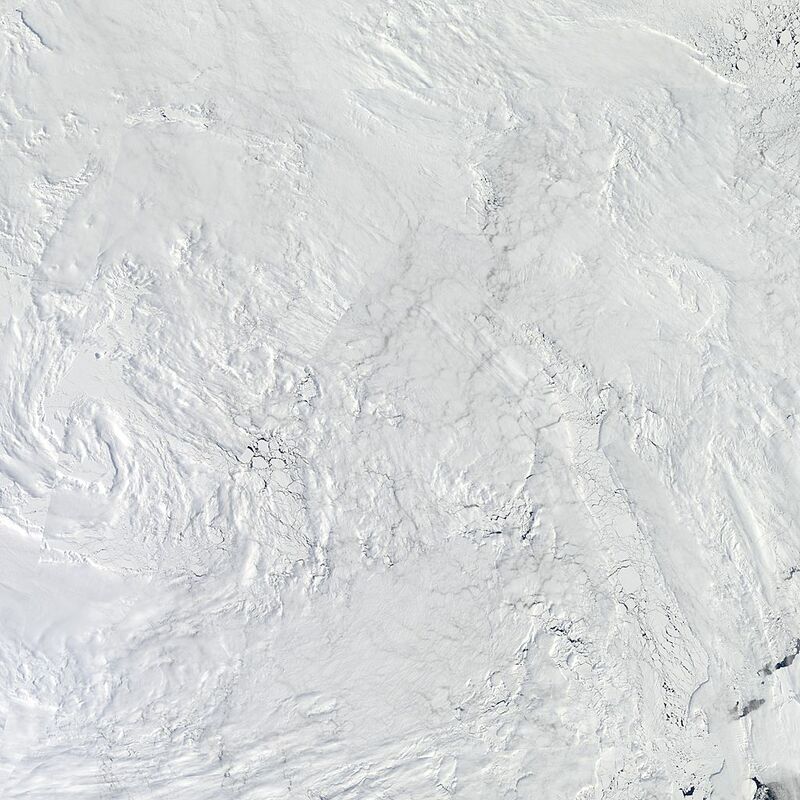 Last of all, let’s take a look at Southern Hemisphere sea ice. Counter to the trend of melt in continental glaciers, Greenland ice, Antarctic ice and Arctic sea ice, sea ice area and extent in the southern hemisphere has been slowly increasing since the 1980s. The rate of increase is small when compared to similar measures of sea ice extent and area in the Arctic — about 1/3. That said, it is important to note that air temperatures in the region of increasing Antarctic sea ice are increasing at rates even faster than around the globe. Furthermore, sea ice volume measurements for the Antarctic are sparse and difficult to come by. So we don’t really know if the surface is expanding even though the ice, in total, may be thinning. Furthermore, studies indicate that sea ice area and extent expansion in the Antarctic are driven by the melting of land ice. As the great glaciers of Antarctica have contributed an average of around 300 cubic kilometers of melt each year, this fresh water has extended around the Antarctic continent. The fresh water freezes at higher temperatures. Also, as the water is already near zero degrees Celsius, it takes less energy to freeze. Last of all, this fresh water cap tends to prevent warm water upwelling from the deep ocean. Such upwelling has tended to melt ice in this region and so the ice is somewhat protected from below by a shield of cold, fresh water. Since we don’t have volume measurements of Antarctic sea ice, we can only assume that the slight increase in Antarctic sea ice extent and area over the past 30 years is also indicative of a small net increase in volume. 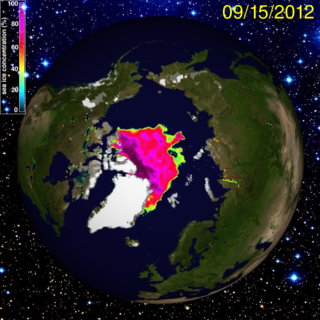 If this is the case, it is the only area around the globe where ice is seen to be increasing. All other areas show rapid decline. And this larger trend is indicative of a massive amount of heat energy going to melt the ice. So what we see, in combining the measures of continental glacier mass loss, Greenland glacial melt, Antarctic glacial melt, and Arctic sea ice melt is a rapid changeover of much of the world’s ice from solid to liquid state. This takes a huge amount of energy and is roughly equivalent to the energy that has gone into heating the atmosphere. When taking into account continued atmospheric temperature increases, increasing ocean heat uptake, and increasing rates of global ice melt, there is absolutely zero evidence that human-caused global warming has paused. Instead, we have seen a much more rapid impact on both the world’s oceans and on its ice over the past decade and a half. Further, though atmospheric temperature increase may have slowed somewhat over the same period, such a slow-down has come at the cost of an increasing pace of impact to both the Earth’s oceans and to its ice. Moving forward, it will be worthwhile for scientists, researchers and environmentalists to continue to keep track of total Earth warming by gaining ever-clearer pictures of ocean heat uptake and worldwide ice melt while also keeping track of atmospheric temperature increases. In total, these provide a much more comprehensive picture of human warming. When taken together we can see that the human impact has been both rapid and powerful, with the pace of impact showing no sign of abating.